A dazzling collection that captures the essence of Hyderabad, offering glimpses of the various strands that go into its making - fact and legend; old-world quaintness and the highest hi-tech; eccentricity and intrigue; the calm of genteelness and the fury of rebellion. Hyderabad is a city once ruled by the world’s richest man who invested most lavishly in his state, most shabbily in his wardrobe. It holds stories of a courtesan who fought wars, counseled prime ministers, sang her own verse and enthralled luminaries who mattered; of a chief minister who transformed it into a hi-tech hub; and of a sports star who brought the young glamour of India to every tennis court in the world. Home as much to the Golconda as to Jacob, the 187-carat diamond used as a paperweight by the Nizam, and to rock landscapes two and a half million years old, Hyderabad is a city that forever mixes cultures, cuisines, religions and languages. Here Persian turned alloy with Telugu, Marathi and Arabic to yield a special version of Urdu, Dakhini. And here, as Andhra mingled with Telangana, a smiling mildness has survived, disarming at every turn, just as grace under pressure, regardless of gender, is unfailing. Kukunoor paint their vivid memories of home; as poets, not just the maverick Makhdoom and Gaddar, raise their voices in song; as statesmen, academics and aficionados hold forth on the completely different Hyderabad each experienced. And when Tejaswini Niranjana profiles the vigilante Vijayasanthi and Dharmender Prasad picks out place names land explains their sometimes almost mystic origins, as Bachi Karkaria, Omkar Goswami and Harsha Bhogle share their typically offbeat views of a favourite city readers will be persuaded to believe they have encountered not a city but the inner workings of a very complex character. Syeda Bilgrami Imam, Fellow of English Literature, Bombay University, moved to , shape and head creative teams in India and Central Asia at two leading advertising agencies; Award—winner for public service and brand communications, a juror at many fora, moderator of Aspen Leadership seminars, she enjoys writing the most. Syeda has written for and edited The Positive Side (Roli), The Making of Advertising (Macmillan), Epiphany (Roli) and HU: The Sufi way (Rumi Foundation). Syeda lives in Delhi but does not pass up a chance to revisit and rediscover her childhood city Hyderabad. Both its core and its periphery meld, making a city what it is. As core survives, staunch and regardless, as periphery flirts and experiments and years go by, something near an identity tends to surface — and this springs to mind at the very mention of its name. Nothing captures it quite, or, for all time. Hyderabad abounds in recurrent images, phrases — and stories that are less myth more truth, than most. All of which tend to give the city a quaint surround, sometimes bemusing, often inaccurate. There is something drone—like about the cliches; the state long presided over by the world is richest man, home to the Salar lung Museum, the Charminar, the Golconda diamonds, and most likely to the Kohinoor, the Orlofli the Jacob, the Hope, the Great Moghul, the Taj—e—Mah, the Darya-i—Noor. As much home to the miraculous asthma-curing rush, which thousands rush to swallow whole on 7 June, timed with the first monsoon downpour. The oddity about Hyderabad perhaps is that its core is not a staid, immovable Fixture, has never been. It strides anew from time to time without losing itself. This may take a while to discover, which too is a good thing about it. The unexpected is tapping your shoulder as you get beyond the handshake and the ambivalent head shake that you are quick to notice about the Hyderabadi. Beyond the elaborate meals, the desultory conversations and the quick rounds with the camera, which could be several and various. You could catch that exotic Banjara/Lambada gypsy or maybe the Khilwat at the refurbished Chowmahal Palace. Quite understandably, you skip the Charminar for that is much too trite, you bemoan that snapping the Veiled Rebecca at the Salar Jung Museum is disallowed. You still have not plumbed any depth though you caught the precarious rock perches dotting Jubilee Hills. You have even strained with the tele-lens to manage the gigantic, do-I-really-belong-here Buddha, plonk in the middle of Hussain Sagar, the lake that weds Hyderabad to Secunderabad. Cruising by it today, you wouldn’t guess that it was fifteen whole miles of placidity when built 450 years ago by Hussain Shah Wali. All this skim of the surface may make you miss, for instance, that the city happens to be as cosmopolitan as Mumbai. And this for two entirely cleft reasons. First, because the city’s core from way back had a verve, a gush it could hardly restrain. Giving the Nizam and his Salar Jungs both the savvy and the wherewithal to pick what they needed of human resource from any part of India and, yes, some parts of Britain. The schoolteachers were often imported from abroad, and the prime ministers regularly, from all over India. Indeed, well before that, diamonds were a magnetic attraction to the Italians, the Russians, the Spanish, the Dutch, the French and, of course, the English. As many as twenty-one prospectors found their way here, including Marco Polo (he had not homed in for the sparkling carbons, though) and Tavernier time and again, none of them in too much of a hurry to get back to where they came from. Second, because those who came to build, to teach, to administer, to research, to write, to fight, to paint, to promote, to govern, to make a living, did not then wish to or bother to leave. A posting in Hyderabad invariably ended with a plot of land bespoken for when you retired, even when the stint was a time—bound commercial or professional one. Why this escapes you is also because the outsider in Hyderabad does not jar. Those who choose to stay on temper their lives, their tastes, their tones and accents, even their slang, to the habitat. They do not need to, or wish to, retain their separateness. This too is different about Hyderabad. Staying on is normal practice and no one looks askance. The explanation seems manifest. After all the living is easy and the changing seasons as mild as the many human equations. ‘Unoo kaan se hayn ki, saalon se yainch hain,’ says the local in his own brand of Urdu. In other words, 'Don’t ask me where they came from, they’ve been here for years. In other words, they are one of us. Thus North India is charmed by a South it relates to; the South considers it a bit of all right, though not well and truly the South. The core once again renews itself Contrary to the reputation of it bring an effete, overcivilized cherisher of the past, the city was a first-timer with ideas whose time was nowhere in the offing. Happily into initiatives which smelt of independence, even defiance. Hyderabad was the first state in the country to separate the judiciary from the legislature (in the time of the sixth Nizam and his imported prime minister Sir Ali Imam, who headed his new and exemplary Executive Council). The first to start a flagship university in the local language, giving Hyderabad the prestigious Osmania University and Urdu a rare pride of place. The first and most amenable modern state (under the first Salar Jung’s reforming zeal) while remaining very much a courtly one. Let us not forget that this habit of grand pioneering belonged to the core of Hyderabad — not inexplicably, not just like that. In fact, it came basis a jewelled foundation. After all, Hyderabad was different from any other state in the Country. From its inception in the fifteenth century and certainly during the Raj. Consider all the prerogatives of an independent oriental king or ruler. They were enjoyed by the Hyderabad Nizams right to the end. Not just the flag, crest, emblem, Khutba and a twenty-one—gun salute, reserved only for kings. Uniquely, an anthem of his very own (and the English Resident stood up to ‘God Save His Highness the Nizam’ in English and Persian ‘Elahi tajaban baashad shahenshaah-e-jehan baashi’ — yes, with the same deference with which he would bow to his own liege and his own imperial anthem). The British Resident learnt Urdu more assiduously than he did most other things. Durbar of the grandest order in the country, with every ceremonial rite. Military (the pick of the local, the Arab, the African and the North Eastern battalions, superbly trained, who fought most of the battles and forays that the British undertook across the world). Coinage and currency (the Hyderabad baali currency prevailed in the area alongside the kaldaar which had currency in the rest of India), railways, roadways, airways, postal network, fiscal systems, estates (Sarf-e-Khas). None of these were denied to the Nizam even when the state was given up in 1948, not till his death in 1967. Approaching a vintage of eighty—four, no less, Masha’allah. As Rajpramukh he desisted from availing of them. That would not be becoming. The seventh Nizam was used then to doing things his way — but with immense regard for the poorest of his ken. Unmindful of being called a miser, with none of his father’s taste for Personal resplendence (he wore clothes that he would consider below him to give away to a beggar), he expended magnanimously on those who served the state. ‘Every village of my kingdom must weave, wear, boast of its own silk’ hence came Paithan, Narayanpet, Pochampally, atlas, mushroo, mushajjar, bimroo and the rumals which are now Preserved like jewels, nestling in mothballs and neem leaves by all who possess them. The aberration of the Razakar movement which actually, and daftly, thought and sought to keep Hyderabad independent of India; the almost consistent neglect of the hinterland, of the traditionally skilled, of the poor, of. the unlettered; the eruption of- roused, engineered hatred from time to time. It is all of a Piece when the managing of a diverse People is afoot, when it is being attempted, yes, but not with the best will in the world. And since a bad story makes for a guaranteed read, enough has been made of all of these every now and then. While the Naxals aim and claim to champion the poor there is a Shri Gurusillu Reddy of- these Parts who feeds vast numbers with a one—rupee lunch. And says, when awarded the Vijay Patra, that no, he is no Samaritan, he manages a profit, thank you. After which he Proceeds to say how. And also, that he is prepared to do it for the entire state, if supported. His tray of food is not what went to the Khanzadas oil the Nizam from King Kothi (it is dul, one sabzi, rice and a chapati), but his will and the intent have the same outreaching Power. Maybe it is a tradition that wears well in these Parts. For Naidu, as in Chandrababu, was no less committed in his ambition for his state, turning a tortoise into a hare, a slowed—down, smug People to a roused, world—witted breed. 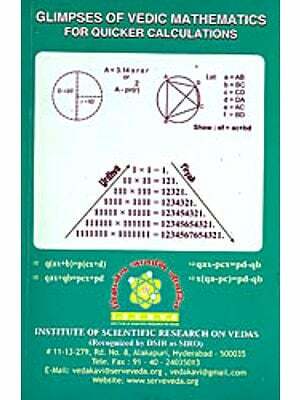 , Science, superbly enshrined at the Council of Scientific, and Industrial Research, now burgeons. There is every logic for iconic stature and reputation for the minds behind Dr. Reddy’s Labs, Satyam and the lesser—known enterprises. The Hitech City is populous, hectic. There is every evidence that this city is a magnet and not just for the Eye-stopping pearls of Moti Galli. And since then the city has actively attracted scientists, bio- technologists and molecular biologists, and thrust forward in information technology, business process outsourcing, research labs, hospitals, ivy—league law and business education. And this has raised many things: work opportunities, standard of living, a culture of the cosmopolite and, best of all, hope. You have a sense of it just as you get off- your plane or train and on to the road. It compares very buoyantly with any other such arrival of yours, anywhere else in our country. Whether this sense travels beyond Hyderabad into the interior remains a question. And so now to the pages you are about to turn. To shift the kaleidoscope on Hyderabad, this way and that, just as you will. It will not be Durrell’s Alexandria, Dickens’s London or Vikram Seth’s San Francisco. It will be gleanings of many who touched this city and were moved; who know and will tell; who relish and wish to share that relish. The more I pressed and prospected for material the more I appeared to be missing out. And the feeling became insistent that I was undeserving of this task of whetting expertly the reader’s appetite for Hyderabad. I have had to leave out so much, knowingly and unknowingly. 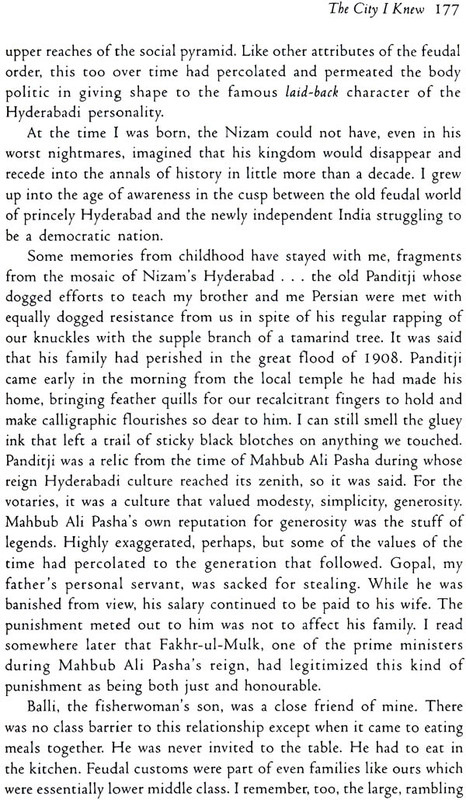 For all of which I hope Hyderabad, and all who care for it, will forgive me. Finally, I seek the indulgence of the reader for not being able to give them phonetic spellings of an exactitude For the Urdu/Persian/ foreign words that occur in the book. This seems neither fair to the tender nor to the author. However, I must thank the Penguin team For agreeing to devise a one-pager pronunciation guide for future publications that need them. The time taken to do it right and well would have delayed this book unconscionably, so do excuse this imperfection, among others. On the other hand, I do not apologize for the different spellings writers choose (I think in an anthology there is a point in allowing those individual preferences). So, as an example, if reference to the local dialect is Deccani, Dakhani, Dakkani or even Dakhni there is a Pleasure in exposing the reader to all the nuances Preferred in a certain locale. Especially since the object of this series is to evoke a place in its many very Particular, even peculiar ways.